The Extang BlackMax Tonneau Cover: The bold, all black tonneau. The Extang BlackMax Tonneau Cover is the perfect solution for the customer looking for that all black look. This Extang engineered snap lock cover installs easily and requires no tools or automotive knowledge to install! No Drilling Required!! 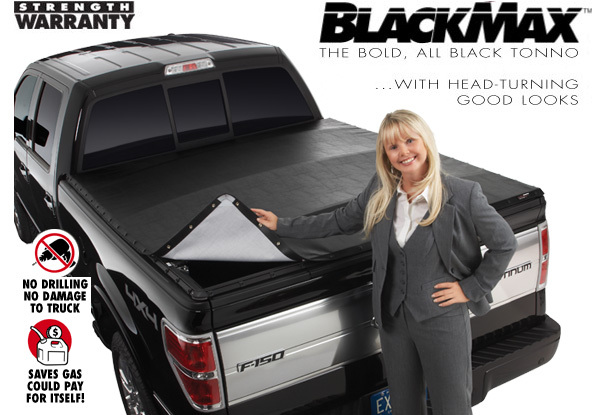 The BlackMax Tonneau Cover Snaps along cab rail allows quick and easy access into the front or back of your truck bed. 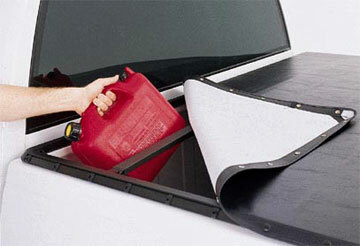 You can even drop the tailgate while the BlackMax Tonneau Cover is fully snapped on. Theres no drilling because the Extang BlackMax Tonneau Cover Frame is custom designed specifically for your make and model of truck. The frame snaps in and the SpringLock bows ensure that the frame doesn�t come off until you want it to! Next the tarp simply snaps into place onto the BlackMax Frame! If taking off the snap cover ever isn�t enough, and you ever want or need to remove the BlackMax snap cover frame, it only takes a second! One-finger removal of the tail rail using the LeverLock system allows quick access for hauling large loads. No hassles or tools! Worried about Quality? Don�t be! The BlackMax features fiberglass reinforced nylon snaps that will not break. The Extang warranty is one of the best on the market: 10 years on the tarp, and lifetime on the frame! Extang is known for their quality, durability, and dependability. The part number for this item is 2750 and it fits: 1997-2004 Dodge Dakota w/ 6 1/2 FOOT BED models. BlackMax�when solid black is the bold good look you want. � Exclusive patented all-climate engineered design that�s 4-way fully adjustable for cold weather. .
� Snaps along cab rail allows quick and easy access into the front of your truck bed. .
� NO drilling, NO damage! . � �SpringLock � bows-easy to install and they�ll never fall off. .
� One-finger removal of tail rail using the �LeverLock � system allows quick access for hauling large loads. No hassles or tools. .
� �SnapStopper � keeps snaps on the rail when tarp is rolled up for bulk hauling. .
� The BlackMax features fiberglass reinforced nylon snaps that will not break. .
� Best warranties: 10 years on tarp, and lifetime on frame! . � Famous Extang engineering, quality workmanship and excellent customer service. .
� Drop tailgate with tonneau on. Installing The Extang BlackMax Tonneau Cover: Great news! 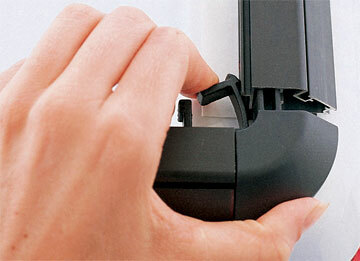 This installation is fast and easy, and best of all DOES NOT REQURE ANY DRILLING OR TOOLS! No automotive knowledge is required. 2. Lay out all parts and make sure no parts are missing. 3. Off the truck bed, connect the end rails to the two side rails utilizing the ClickLock clips. 4. Place the rail assembly over the side of the truck box. Center rails evenly between cab and tailgate. 5. Clamp Spacing (Same for each side) See the stickers located on each side rail for clamp position. Note: Remove stickers on the rails after installation. 6. Attach �U� clamp to side rail clamp with included allen bolt. Insert side rail clamp all the way into rail. 7. Insert bow onto top or bottom peg. (Top peg for performance, Bottom for good looks.) Ends are spring loaded for easy installation. Push and hold on spring end and let the other end slide on with the spring action. 8. Attach tarp by starting at the corners, and snap in place. Installation is now complete! Congratulations on your new Extang BlackMax Bed Cover Installation!